Detail of Darius III from the Alexander Mosaic. Darius III (c. 380 – July 330 BC), originally named Artashata and called Codomannus by the Greeks, was the last king of the Achaemenid Empire of Persia from 336 BC to 330 BC. Artashata adopted Darius as a dynastic name. In 334 BC, Alexander the Great began his invasion of the Persian Empire and subsequently defeated the Persians in a number of battles before looting and destroying the capital Persepolis, by fire, in 331 BC. With the Persian Empire now effectively under Alexander's control, Alexander then decided to pursue Darius. Before Alexander reached him, however, Darius was killed by the satrap Bessus, who was also his cousin. Artashata was the son of Arsames, son of Ostanes, and Sisygambis, daughter of Artaxerxes II Mnemon. He had distinguished himself in a combat of champions in a war against the Cadusii and was serving at the time as a royal courier. However, prior to being appointed as a royal courier, he had served as a satrap (governor) of Armenia. He may have been promoted from his satrapy to the postal service after the ascension of Arses, for he is referred to as one of the king's "friends" at court after that occasion. In 336 BC, he took the throne at the age of 43 after the death of Artaxerxes III and Arses. According to a Greek source, Diodorus of Sicily, Artashata was installed by the vizier Bagoas, after the latter had poisoned the king Artaxerxes III and subsequently his sons, including Arses, who had succeeded him on the throne. However, a cuneiform tablet (now in the British Museum) suggests that Artaxerxes died from natural causes. Artashata took the regnal name Darius III, and quickly demonstrated his independence from his possible assassin benefactor. Bagoas then tried to poison Darius as well, when he learned that even Darius couldn't be controlled, but Darius was warned and forced Bagoas to drink the poison himself. The new king found himself in control of an unstable empire, large portions of which were governed by jealous and unreliable satraps and inhabited by disaffected and rebellious subjects, such as Khabash in Egypt. Compared to his ancestors and his fellow heirs who had since perished, Darius had a distinct lack of experience ruling an empire, and a lack of any previous ambition to do so. Darius was a ruler of entirely average stamp, without the striking talents and qualities which the administration of a vast empire required during that period of crisis. In 336 BC Philip II of Macedon was authorized by the League of Corinth as its Hegemon to initiate a sacred war of vengeance against the Persians for desecrating and burning the Athenian temples during the Second Persian War, over a century ago. He sent an advance force into Asia Minor under the command of his generals Parmenion and Attalus to "liberate" the Greeks living under Persian control. After they took the Greek cities of Asia from Troy to the Maiandros river, Philip was assassinated and his campaign was suspended while his heir consolidated his control of Macedonia and the rest of Greece. In the spring of 334 BC, Philip's heir, Alexander, who had himself been confirmed as Hegemon by the League of Corinth, invaded Asia Minor at the head of an army of Macedonian and other Greek soldiers. 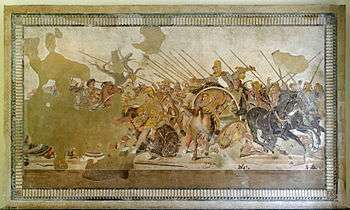 This invasion, which marked the beginning of the Wars of Alexander the Great, was followed almost immediately by the victory of Alexander over the Persians at Battle of the Granicus. Darius never showed up for the battle, because there was no reason for him to suppose that Alexander intended to conquer the whole of Asia, and Darius may well have supposed that the satraps of the ‘lower’ satrapies could deal with the crisis, so he instead decided to remain at home in Persepolis and let his satraps handle it. In the previous invasion of Asia Minor by the Spartan king Agesilaus, the Persians had pinned him in Asia Minor while fomenting rebellion in Greece. Darius attempted to employ the same strategy, with the Spartans rebelling against the Macedonians, but the Spartans were defeated at Megalopolis. Darius did attempt to restore his once great army after his defeat at the hands of Alexander, but he failed to raise a force comparable to that which had fought at Gaugamela, partly because the defeat had undermined his authority, and also because Alexander’s liberal policy, for instance in Babylonia and in Persis, offered an acceptable alternative to Persian policies, which had changed from the policies created by Cyrus the Great in the Cyrus cylinder, which is considered the first charter of human rights. When at Ecbatana, Darius learned of Alexander's approaching army, he decided to retreat to Bactria where he could better use his cavalry and mercenary forces on the more even ground of the plains of Asia. He led his army through the Caspian Gates, the main road through the mountains that would work to slow a following army. The Persian forces became increasingly demoralized with the constant threat of a surprise attack from Alexander, leading to many desertions and eventually a coup led by Bessus, a satrap, and Nabarzanes, who managed all audiences with the King and was in charge of the palace guard. The two men suggested to Darius that the army regroup under Bessus and that power would be transferred back to the King once Alexander was defeated. Darius obviously did not accept this plan, and his conspirators became more anxious to remove him for his successive failures against Alexander and his forces. Patron, a Greek mercenary, encouraged Darius to accept a bodyguard of Greek mercenaries rather than his usual Persian guard to protect him from Bessus and Nabarzanes, but the King could not accept for political reasons and grew accustomed to his fate. Bessus and Nabarzanes eventually bound Darius and threw him in an ox-cart while they ordered the Persian forces to continue on. According to Curtius' History of Alexander, at this point Alexander and a small, mobile force arrived and threw the Persians into a panic, leading Bessus and two other conspirators, Satibarzanes and Barsaentes, to wound the king with their javelins and leave him to die. 1 2 3 Heckel, Waldemar (2002). The Wars of Alexander the Great. p. 24. ISBN 978-1841764733. Retrieved 19 June 2012. ↑ Jürgen von Beckerath, Handbuch der ägyptischen Königsnamen (= Münchner ägyptologische Studien, vol 46), Mainz am Rhein: Verlag Philipp von Zabern, 1999. ISBN 3-8053-2310-7, pp. 230–31. ↑ Plutarch, Life of Alexander 18.7-8, First Oration on the Fortune or the Virtue of Alexander, 326.D. ↑ Kia, Mehrdad (2016). The Persian Empire: A Historical Encyclopedia. ABC-CLIO. p. 160. ISBN 978-1610693912. ↑ "DARIUS v. Darius III". Encyclopaedia Iranica, Vol. VI, Fasc. 1. 1994. pp. 51–54. ↑ Hermann Bengtson, History of Greece from the Beginnings to the Byzantine Era, p. 205. ↑ Arrian, The Campaigns of Alexander. ↑ John Prevas, Envy of the Gods: Alexander's Ill-Fated Journey across Asia (Da Capo Press, 2004), 47. ↑ Ulrich Wilcken, Alexander the Great. 1 2 3 N.G.L. Hammond, The Genius of Alexander the Great. ↑ W.W. Tarn, Alexander the Great. ↑ This was a different Bagoas than the unfaithful minister mentioned above. Crompton, Louis. Homosexuality & Civilization (Belknap Press of Harvard University Press, 2003), p. 76.